This isn't the first time he's done it! (SPOT.ph) Aside from being a talented actor (his role in Die Beautiful earned him the Best Actor award at the 29th Tokyo International Film Festival and the 42nd Metro Manila Film Festival), Paolo Ballesteros is also a great artist. He's known for posting mesmerizing makeup transformations online and his colorful canvas paintings also sell out before they're even finished. (Fun fact: He's the great-grandson of the first National Artist for Visual Arts, Fernando Amorsolo.) The actor is showing that there's more where that came from as he recently revealed that he also designs gowns for beauty pageants. In an Instagram post on September 11, Ballesteros posted a zoomed-in photo of a white gown. "I have designed gowns and Filipinianas for pageants before, pero secret lang. Ngayon hindi na secret," he shares. He then wished Mutya ng Pilipinas candidate Agatha Romero luck for the competition. 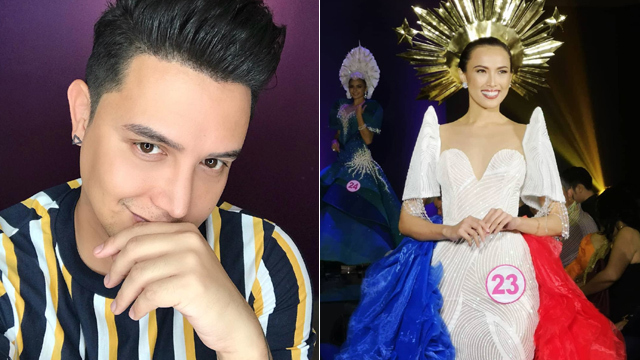 He also thanked his friends Ian Paul Semira, Jian Lasala, and Manny Halasan for helping him execute the design for the pageant's terno competition. On September 12, Ballesteros posted a video of Romero wearing the gown on stage. The white gown has the traditional-looking puff sleeves on top with a navy blue skirt at the bottom. Romero then turns the skirt inside out to reveal vivid blue and red ruffles draped on each side of the gown. With the colors of the gown and a crown with three stars and a sun (made by Halasan), Romero walks down the runway with a look that seems to be inspired by the Philippine flag. In an interview with Pep.ph, Ballesteros talks about how much he loves pageants. "Mahilig kasi talaga ako manood ng mga beauty pageants. Tapos pag may mga friends ako na nagpapatulong sa makeup [at] styling ng isang candidate, tinutulungan ko." He also reveals that he's designed gowns for other pageants like Binibining Pilipinas and Miss Earth before. As for now, though, he says he's only designing for fun. "Madami pa akong dapat matutunan kung magve-venture ako sa ganitong business. And I don't think I have the time para mag-aral and all." Romero, meanwhile, thanked Ballesteros for being the first known person to have worn his "masterpiece." She says, "Thank you for trusting me to wear your first (known) creation, Kuya Paolo! I am so proud to see you finally rocking the fashion industry. You are a great artist, indeed." 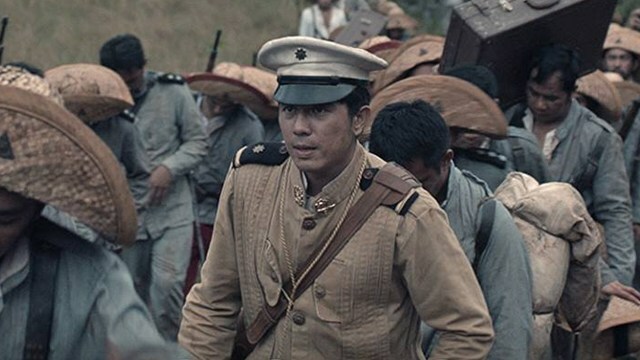 It's always nice to see celebrities exploring their other passions behind the camera, and we wouldn't be surprised if Ballesteros still has a couple more talents up his sleeve.